With style reminiscent of a miniature Versailles. With style reminiscent of a miniature Versailles, this striking chateau in Normandy conjures the grandeur of the 17th and 18th centuries from the moment you approach it through the tree-lined driveway. The chateau effortlessly combines classic touches (from the stonework in the garden to the Aubusson carpets and even an original c17th backgammon set), with the modern amenities you expect, such as jetted tubs, Nespresso machine, widescreen TV (with Netflix and DVD) and the heated pool, to name just a few. This is no dark and dreary castle - large windows on both sides of the chateau let light stream in throughout the day. Sportsmen and women can compete on the private tennis court, do some laps in the pool, fish in the moat, and bicycles are also available for anyone wanting to leave the extensive grounds. The beach at Fontenay-Sur-Mer for example is within easy biking distance. Through the gardens, 100m away from the main chateau, is a separate cottage that's perfect for a small family who prefers more privacy. Here, your family chateau holiday includes the best of both worlds: peaceful French countryside, with access to historic sites. Only 15 minutes away WWII history comes to life in the town of Sainte-Mere-Eglise and Utah Beach, the site of the D-Day landing. Cherbourg & Caen are the nearest port and airport, but it is also convenient to drive from Paris, just 3 hours away. Please note this property is available for groups of up to 14 guests when renting the chateau and the cottage. 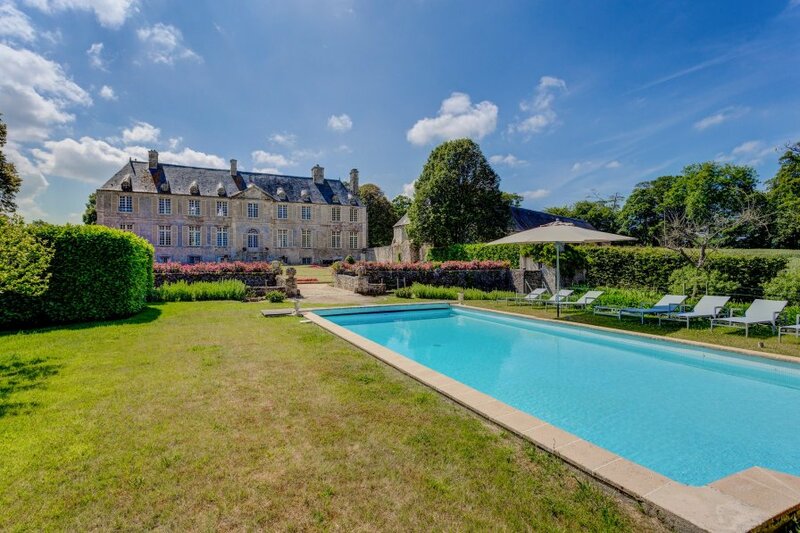 For smaller parties of up to 10 guests, the chateau on its own can be rented at a reduced price. - A large kitchen (50 m²) equipped with two electrical ovens, 3 electric halogens hot plates, an electric plancha, full height refrigerator with freezer compartment, dishwasher and lots of cooking equipment. Sufficient crockery, silverware and glassware for the rental capacity; kitchen table for up to 10 and a bar counter for up to 5. - A large TV/Playroom (65 m²) with satellite TV, DVD-player, Hi-Fi, bookshelves, Wi-Fi, two Chesterfield sofas, armchairs, games table (some DVDs & English books are available). - A large Louis XIII dining room (50m²) with a maximum capacity of 14/18. Kitchenware is furnished for to cater for the maximum capacity. - A small dining/breakfast room for up to 8 is equipped with dishwasher, 2 hot plates, sink, microwave, refrigerator,toaster, coffee and Nespresso machine and crockery. - A large Regency bedroom (30 m²) with a double bed (140x190), shower, toilet and a small hand basin. - A cloakroom with phone, Wi-Fi printer, umbrellas and cupboard with numerous regional guides. - A large guest WC with double sinks, cupboard with numerous vases. - A large blue Louis XV Drawing Room (50 m²) with meridienne, armchairs, game table and Piano forte (not tuned!). A great spot for a gin and tonic pre-dinner! - A Louis XIII library/drawing room (45 m²) with sofa, armchairs, desk, tapestry, bar, Hi-FI. - A large double en-suite bedroom (30 m²) with a double bed (140x200) with bathroom with double sinks, separate shower, Jacuzzi bathtub and WC. - Two single bedrooms: each with a 100 x 190cm bed, one with a shower and hand basin; one with a bidet and hand basin. - A laundry room with washing machine, dryer, ironing table. - A large double en-suite bedroom (35m²) with a 140x200 electrical bed and bathroom with bathtub, separate shower, WC, and en-suite dressing room, mini TV (only local channels). - A twin bedroom (25 m²), with two single beds 90x200 which may be joined on request. - A child bedroom/den with a small bed 80x150 (not accounted for in the sleeping capacity). This connects with the twin bedrooms so works well for small children. - A hall bathroom which connects to the twin room but can also be accessed from the corridor, with sink & bathtub. Located 100m from the main house. It includes a separate bathroom with bathtub, sink and WC, a fully equipped kitchen/dining room (oven, fridge, dishwasher, microwave, hot plates etc) and living room. Upstairs there are 2 bedrooms, one with a 140x200 bed which can be split and one with 2 90x190 beds. Chateau de Cource lies in the heart of the wild and beautiful Cotentin Peninsula area in Normandy, in Fontenay-sur-Mer, 300km west of Paris. The closest train station is Valognes (12 km). You can discover and enjoy the local area by walking or biking through the beautiful and peaceful countryside. There are many bikes available at the chateau (free of charge) so we recommend exploring the local area this way as the roads are so quiet. During your stay you should visit the historic town of Valognes, particularly the Hotel de Beaumont and the famous Cider Museum. Here you will find everything you need during your stay (supermarket, shops, restaurants etc) and it is only ten minutes drive away from the chateau. The chateau is 3 miles from the beach and an 18 hole golf course created 30 years ago by the father of the current owner of the chateau! There are also several riding clubs around where lessons or private hire can be organised. - 45 mins to The Bayeux Tapestry. - 2 hours to Honfleur. - 2 hours to Gardens at Giverny (Monet). - 2 hours to Rouen. - 3 hours to Paris by car or train.